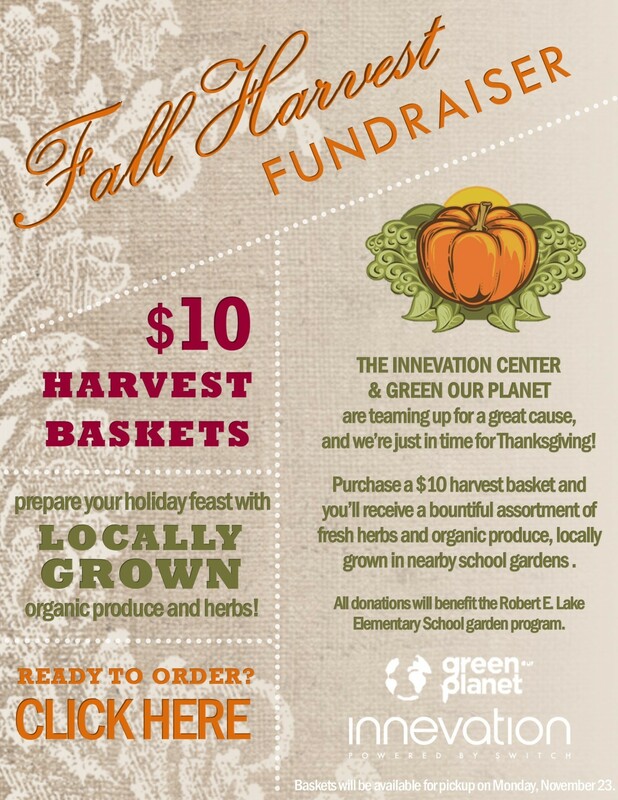 The Innevation Center and Green Our Planet are teaming up to host a Fall Harvest fundraiser to benefit the students of Robert E. Lake elementary school. For a $10 donation, donors receive a Harvest Basket filled with fresh herbs and organic produce, locally grown in nearby school gardens. Green Our Planet’s offices are located at The Innevation Center and their team is very active in the space’s collaborative community. Phillips says The Innevation Center team believes that what Green Our Planet are doing for the community is incredibly important, especially their Outdoor Garden Classroom Program. “The goal of the Outdoor Garden Classroom Program is to help public and private schools raise funds and build outdoor vegetable gardens where students can be taught a variety of subjects including STEM, health, and nutrition education,” she explained. All proceeds from this fundraiser will go towards the garden program at Robert E. Lake elementary school which includes weekly garden education for students and teachers in addition to spring and fall cooking demonstrations by Green Our Planet’s chef partners. Those interested in being involved can click here to place their order. Baskets will be available for pick up beginning Monday, November 23, 2015. Bring your donation at time of pick up.